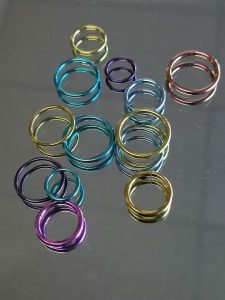 Anodizing is a process that uses electricity to create an oxide layer on the surface of Titanium and Niobium body jewelry, which reflects light to show different colors. The different colors are achieved by using different volts of electricity. The color options mimic the colors seen on an oil slick. What are the benefits of Anodizing? 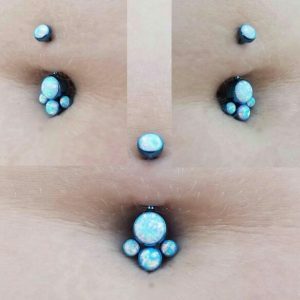 This is a safe way to achieve your goal of having different color body jewelry without the fear of having the color coating flaking off to expose metals that are not made of implant grade materials, which could cause allergic reactions. 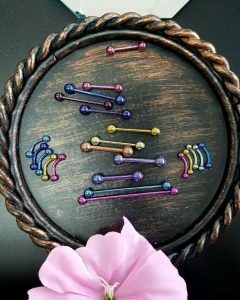 Anodizing your jewelry will allow you to color coat your entire look with implant grade materials. 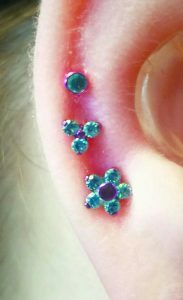 Our favorite use for anodizing is to get the look of gold body jewelry without paying the price of real 14k gold. 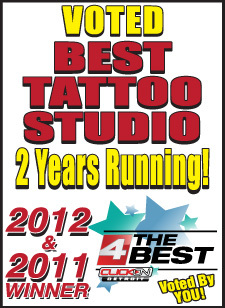 We can mimic gold, and rose gold as well as many other colors! 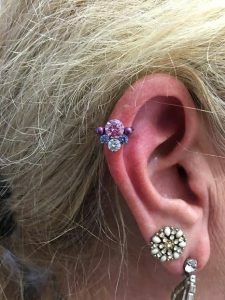 For a full list of color options available please visit one of our two locations to speak with one of our knowledgeable piercers about how to upgrade your piercings with anodized body jewelry!